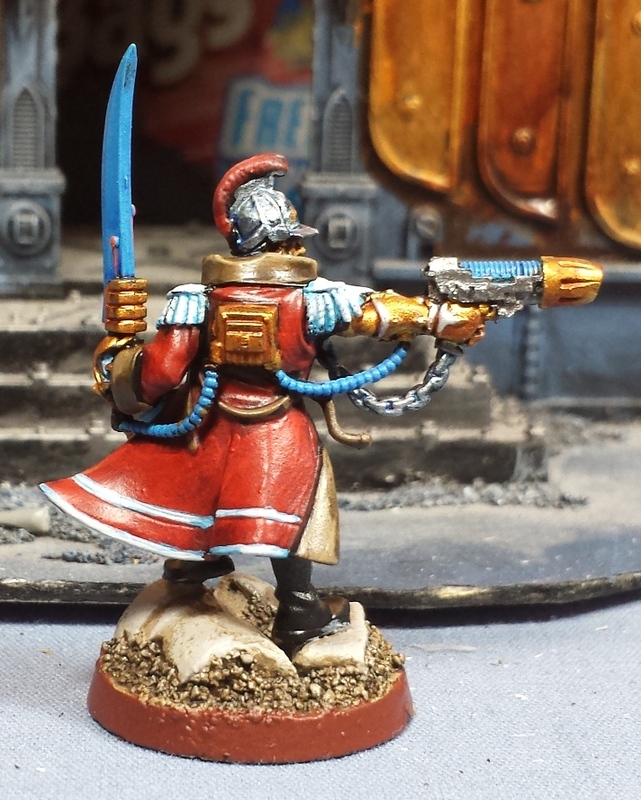 Mordian 7th Regiment: Heresy Era Thousand Sons - More HQ for the Sons! Real Life(tm) has been taking up most of my time of late, so I've narrowed my sights down to doing some character models, where I can sneak in a half hour here and there and still feel like I accomplished something. To that end, Captain Sokhem Vithara has been getting all the brushtime I've had over the last week! Rather pleased with how he turned out. It was suggested that the plastic plasma pistol ought to be swapped out with a heresy variant, which really helped change the look. As far as painting him went, the silver on the helmet and chain got a blue wash and a silver highlight rather than the usual boltgun metal/black wash/boltgun metal, which I think helps set it apart from the weapon, but also subtly complements the blue of the powersword/cables/plasma pistol. I'd tried a couple colors for the sash, but ended up settling on the white as all the other colors just looked too jarring - when in doubt, I find its best to try and stick with three main colors on a model! As a reward for painting some stuff recently I indulged in some build time - The current iteration of the list I'm taking to Feast of Blades next month includes a trio of sorcerers (in lieu of a proper Ksons list from FW, I figure it'd at least be fluffy to run a lot of psykers) and as I only had two, a third was in order! 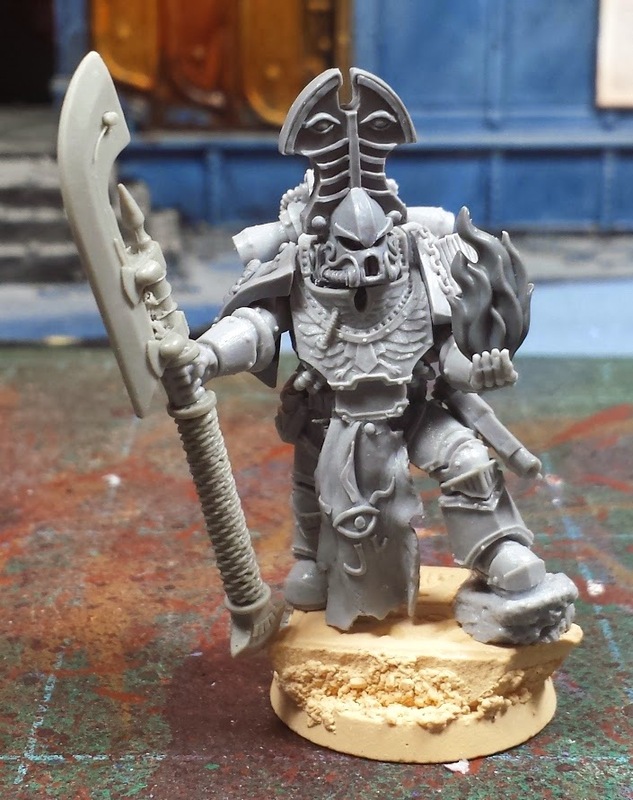 I had a leftover Praetor in artificer armour that acted as the basis for the model - The original loincloth was cut away and replaced with one from the russian set, and the arms were replaced with some basic MkIII's (going to save the archaeotech pistol for something else). The khopesh-style staff is from Kromlech, while the helmet and shoulder pads are also from the russian kits. To help sell that he's a sorcerer I rooted around in the Closet of Doom for some Empire Flagellants and nicked a flame from one of their torches to represent some warpfire. Bolt pistol mag-locked to the thigh plate and job's a good 'un! I'm rather happy with how this one turned out, and can't wait to get some paint on him - In fact I HAVE to get some paint on him in order to use him at the tourney coming up on the 12th! Eep! I really dig Vithara. 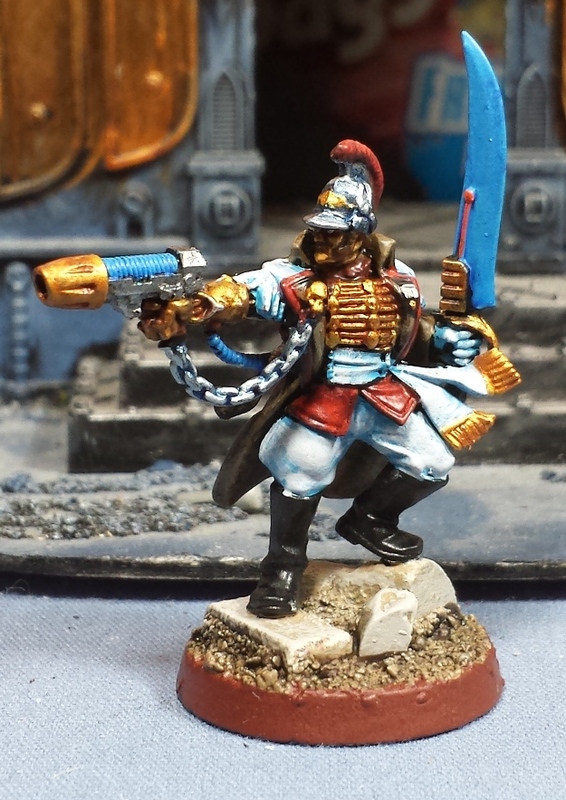 The white trousers and red jacket give him a totally different feel to the normal Commissar that he is based off. You've got some milage from those Russian bits. Agree. The White trousers are definitely a standout. The blue works with them really well. Also triple Sorcerers? AWESOME. Especially cause they look so darn cool! Reminds me to get working on my triple weirdboy list...time to FACE OFF! 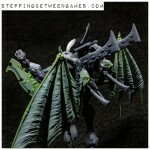 New sorcerer also looks the business. Fire effect is perfect touch. @Greg Hess: Cheers, man! Drop me a line if you make it to CO and we'll throw down, you bet! @Zab: Haha! -1LD for the fashion faux pas! @Dai: Thanks man! Aye, he's got the major jodhpurs going on! Love Captain Sokhem Vithara, simple effective conversion and I think you have done the right thing keeping the colour count down, the sash really works in white. Can't wait to see more heresy era Army, assuming some is coming? I don't indulge in the heresy books but love the forgeworld models! @Buffer: Thanks man! Aye, there's going to be a fair bit of the Imperial Army to come. Leading off with an expanded Prosperine Spireguard to accompany the Thousand Sons, but I'm going to have to get my hand son some of the upcoming Solar Auxilia as well!